The strange shape of this mushroom, which I’ve only seen once, immediately attracted my attention though the ones I bought are nothing as spectacular as ones that can be found in the wild. 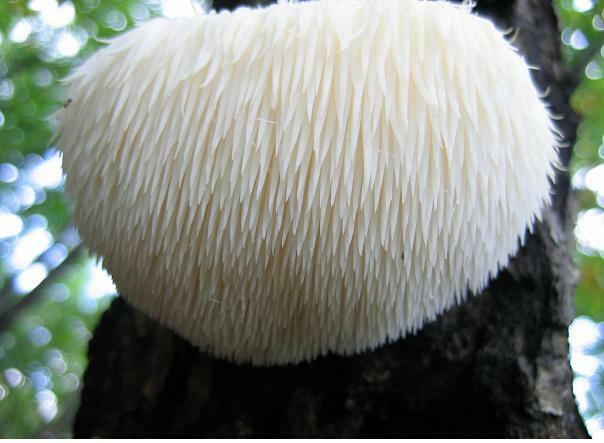 The Lion’s Mane Mushroom, Hericium erinaceus, is also known as the Bearded Tooth Mushroom, Satyr’s Beard, Bearded Hedgehog Mushroom and the Pom Pom Mushroom. In the more spectacular examples, ‘pom pom, is an apt comparison. The size of this mushroom varies from that of a golf ball to not much less than a regular football and its natural habitat is on the side of trees. 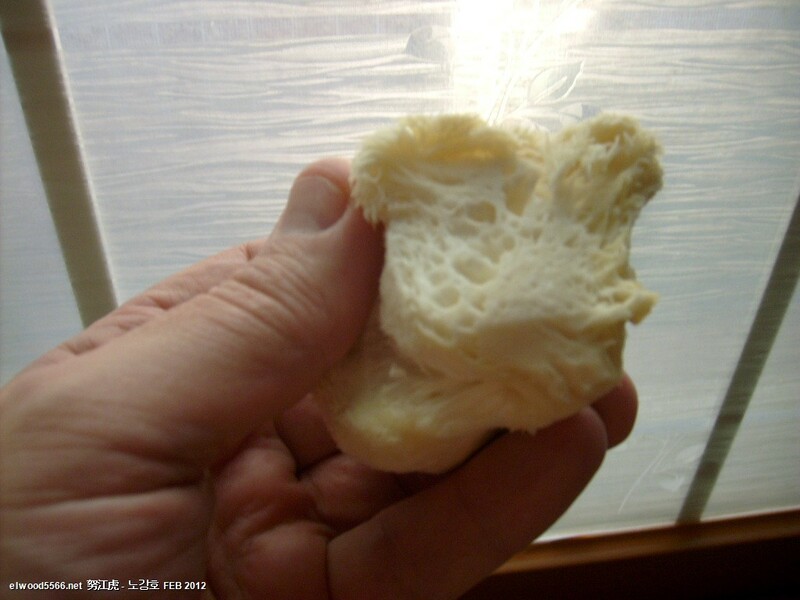 The mushroom is particularly prized when small as it has a seafood texture and taste and is sometimes compared with lobster. The mushroom has a long history of medicinal use in the Orient and is currently of interest in the treatment of Alzheimer’s. I had no idea what to expect or the best way to cook them so I simply fried slices in sesame oil. I was surprised by their weight as they are are heavier than they look and neither are they solid having substantial ‘air pockets’ inside. 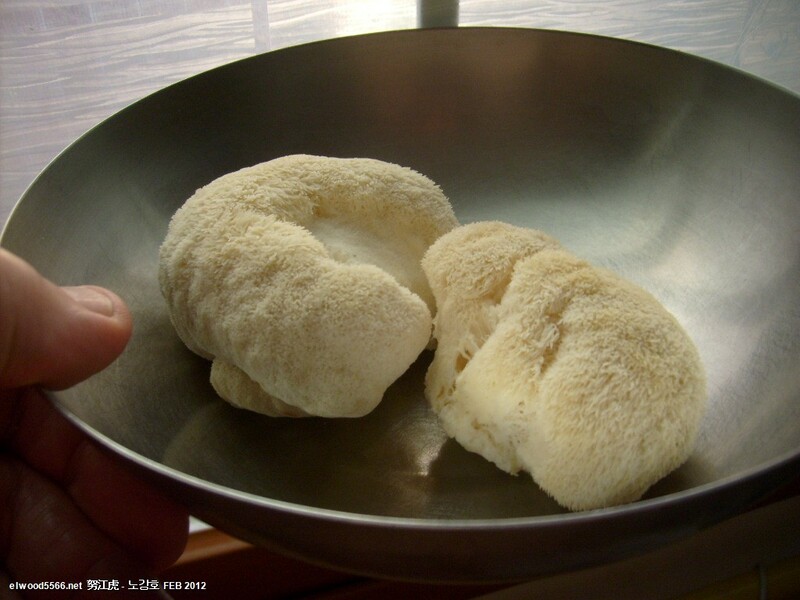 Indeed, in terms of cutting and feel, they are both spongy and watery. I didn’t find their taste particularly memorable though they were extremely succulent but because this was a first experience, I didn’t what to expect. Now I know a little about them, I’d like to try them again. However, currently, they are more expensive than lobster. Two, each between the size of a golf ball and tennis ball, cost 2700W (about £1.50); my last lobster cost 6500W (£3.25).